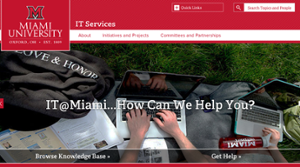 On Thursday, April 13 IT Services launched Phase One of a new website: MiamiOH.edu/IT. The IT communications staff is proud to announce that this new web presence provides quick and easy access to information and support for Miami faculty, staff, and students using technology. Working with UCM web specialist, Karen O’Hara, Hollowell built the site in the Cascade content management system (CMS), using a new University branded template. Using the CMS provides many benefits, not the least of which is the assurance that IT’s site meets Miami’s accessibility standards. IT also enjoys the knowledge that as the Miami brand and templates evolve, our site will stay current. This launch represents Phase One of a three-phase plan. Now that the basic goals and priorities have been met, the IT communications group will be gathering feedback on the new site and constructing the path for the next two phases. Specific feedback on the new site may be sent to MUIT-COMM@MiamiOH.edu.